I am new to the form and new to motorcycles. I just bought my first bike today. 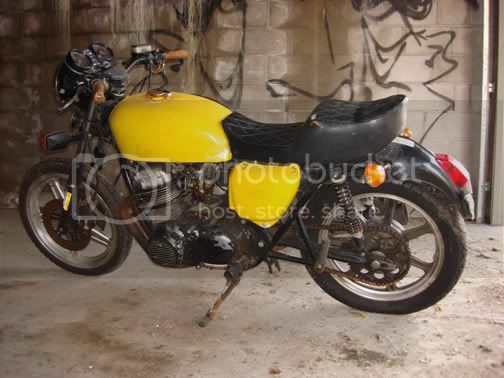 I picked up a 1976 Honda CB 750. It is a non runner at this time but I am looking forward to getting it running and fixed up over the next few months. My first of many questions to come, is. How do I tell if I have a K model or an F model? I want to get a good repair manual for it as I have the feeling it is going to come in handy and I want to get the right one. If you have any recommendations for what repair manual to get that would be great too. K models had 4 into 4 exhausts. F models had a 4 into one. The F also had a rear disc brake while the K had a drum. The F had a plastic tail section behind the seat while the K did not. There are some internal differences too. Valves, gear ratios, etc. Ok, well I have a 4 into one exhaust, and a plastic rear fender and a rear mechanical drum with dual front calipers. Is there a site out there any place that I can put the serial number in and find out what I have? The manufacture date is 1/1975 and it is a production year model of 1976. I got the carbs pulled off, front calipers, gas tank and side covers as of now. Getting the carbs rebuilt should be a good winter project. I plan on painting the tank and side covers this winter too. Wish me luck! Yous is probably a K with a second front disc added. No 1976 Honda 750s had dual front discs. With the rear drum it is almost certainly a K with an aftermaket exhaust. Is the exhaust a huge chrome tapering muffler that's pretty quiet? This picture shows a stick 76 F exhaust and the plastic rear seat section. It is a not running right now. I just got it this last Friday (11/27/09) so I dont know what the exhaust sounds like. It does have a fairly big muffler that I think has been painted black along with most of the engine and transmission case. The engine serial # and the bike serial number are not matching making me think that the engine has been swapped out at some point. The guy I got it from has had it since the early 80's so the first owner probably did the engine change. The correct technical designation for your motorcycle is "Parts-Bin Bike." "The engine serial # and the bike serial number are not matching making me think that the engine has been swapped out at some point." How do you know they didn't swap out the frame? "The guy I got it from has had it since the early 80's so the first owner probably did the engine change." That's a single overhead cam engine so it's older than '75. ....What we politely call a Frankenstien, IE different parts from dead motorcycles......good luck my friend, you'll need it. Not to rain on Timrek's parade here but is what he is doing a good idea? If you always loved and wanted a certian model and this was your chance who can blame anyone for following their passion. But if this is just a chance to get your hands on a bike cheap and get it running good for spring I woulda spent a little more money and less time. I'm not a risk taker when it comes to these things, I'll fix what I have to but dont accept it as a challenge .... more of a nusiance. Good luck to you and I hope your not in over your head, as I would already be, stay patient and you may be an expert by April.